Hi, thanks for info on the Kunisada print. I'd really appreciate the benefit of your expertise in identifying the author and title of this print, and any other information that you can provide. Could it be Tokoyuni 1 ? The print depicts a story from "The Tale of the Heike"
Thank you both for a wonderfully comprehensive reply. I love the poetry of the title and it's great to know more about Japanese art and literature. I found this print in a folder amongst my father's things It almost certainly came from my grandfather who had a great interest in art in general and a small collection of Japanese prints. 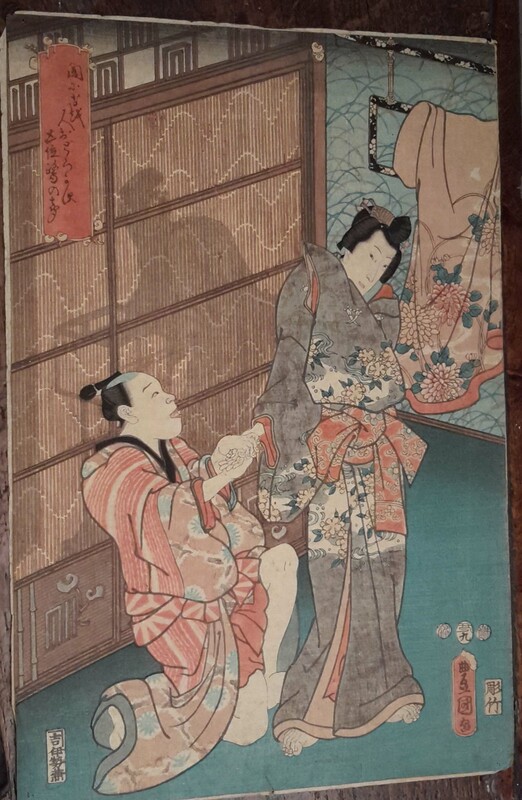 The other Kunisada print which you so kindly identified was bought more recently. 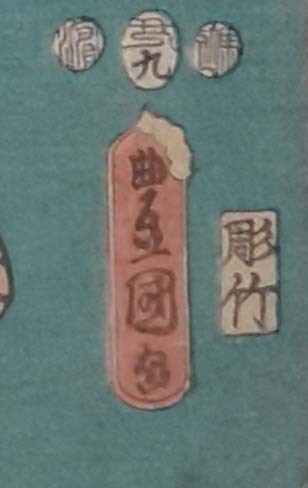 The signature is "Toyokuni". However, the artist is Utagawa Kunisada (aka Toyokuni III). It was printed in the ninth lunar month of 1853 (long after Toyokuni I died in 1825). The top of the screen appears to be composed of genji mons. Likely, this print has to do with the Tale of the Genji. The genji mon on the lower left of the screen corresponds to Chapter 21 - Otome (The Maiden). This appears to be reflected in the subject of the print with a man kneeling at a maiden's feet. Or the screen is just decorative. Perhaps, I. Nagy will translate the cartouche at the upper left, and we will know all. Assuming that it is a genji print, then the man kneeling is likely Prince Genji himself.